We are currently working on a football/soccer Scouting database. The system will be easy to use for managers and scouts. Entering information and reports is done to speed up the data collection process. The system can be securely access 24/7. The screen showing allows the team to be enterred and shows multiple formations. Entering the team number in a position automatically inserts the players name, making it much easier for scouts to define the playing formations. 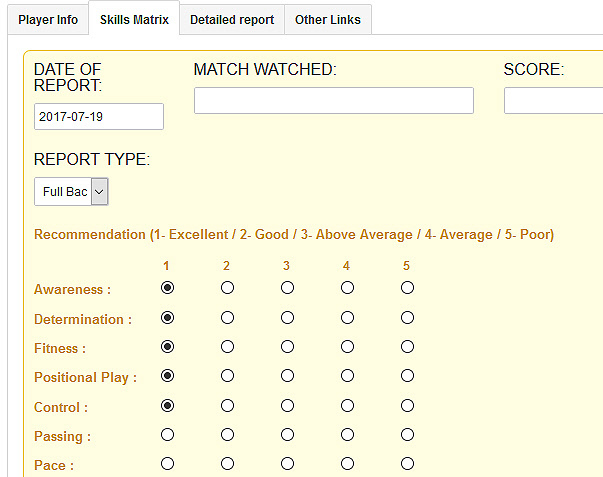 The screen above also shows the Player Skill ratings for a player, showing the simplicity for entering such details. Once the data has been entered the system can be searched on a wide variety of data.